Kasumi Todoh (藤堂 香澄) is the daughter of Ryuhaku Todoh, the first enemy in the original Art of Fighting. She is a deciple of the Todoh school of Aikido and Kobujutsu, taught to her by her father. She is looking for revenge against Ryo Sakazaki for bringing dishonor to her father and her whole family. 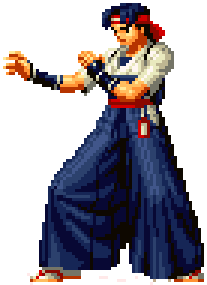 Kasumi went on to participate in the The King of Fighters '96 tournament with King and Mai Shiranui, replacing Yuri Sakazaki who left for Ryo's team in place of Yuri's father Takuma (Takuma threatened to freeze Yuri's assets in order to motivate Yuri to join Ryo's team). After Goenitz, the highest priest of the Orochi Power, was defeated (not to mention taking his own life), King took Mai and Kasumi to her bar to celebrate the victory. This page was last edited on 10 February 2018, at 06:17.